The goal of this project is to use hypervelocity impacts of single mass- and charge-selected nanoparticles and atmospheric aerosols as a probe of the composition, impact dynamics and phase- dependent properties of the particles. The major components of the apparatus allow for the trapping of particles, measurement of the mass and charge of single particles, acceleration or deceleration of that particle to a discreet velocity, and finally, impact of the particle on an inert surface with mass- and charge-selective detection of the chemical products of the impact. Charged particles are introduced into the machine through an Electrospray Ionization Source (ESI) where they pass though a set of aerodynamic lenses to collimate the beam of particles as they are transferred into higher vacuum. The particles are then passed through a quadrupole deflector (QD) which energetically selects particles and bends them 90° into the next chamber. Single particles are injected into a mass spectrometer that we refer to as the nanoparticle electrostatic trap (NET). Using charge- detection mass spectrometry in the NET, the mass and charge of a single particle is measured. 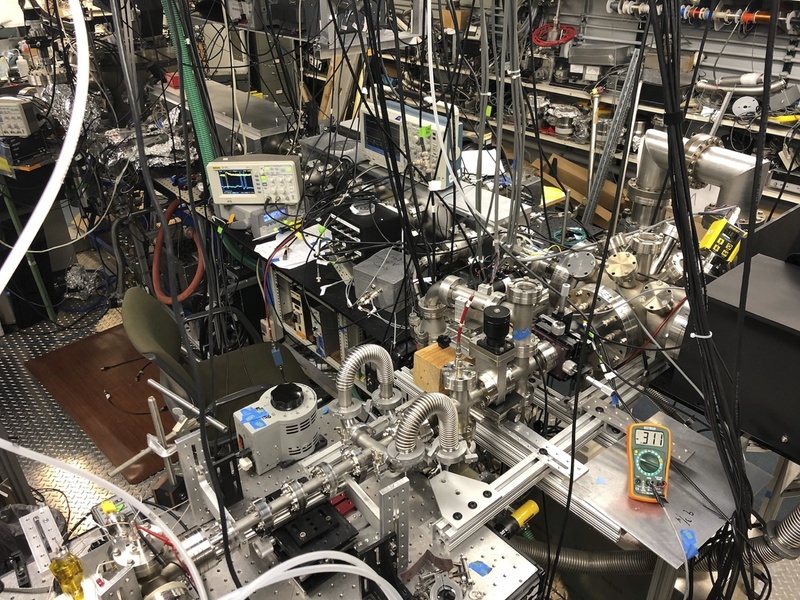 This information is measured and used on-the-fly which allows the timing sequence of a multi-stage linear accelerator/decelerator (LINAC) to be programmed for every trapped particle. Subsequent ejection of the particle into the LINAC determines the particle’s final energy and each accelerated /decelerated particle is impacted on a surface. Charged desorption products and particle impact dynamics are measured by utilizing various charge sensitive detectors including multi-channel plates, image charge detectors, and optical scattering measurements. 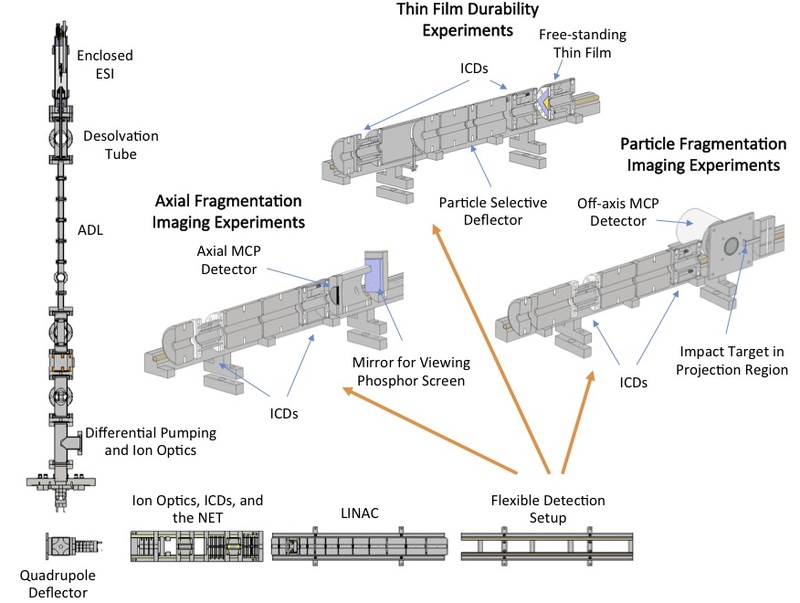 A flexible detection set-up allows for various information to be collected including: nanoscale thin-film durability, inelastic energy loss of particle impacts, and particle fragmentation dynamics.